Rare Pennies with Bullish Futures. Advice for the cent collector. Here are a few rare pennies with bright futures. As a side note, please forgive us for using the informal term "pennies" -- veteran collectors properly call this coin the CENT, but more often than not, society refers to it as the "PENNY" (on second thought, let's not teach bad habits, so from now on, we'll employ the proper numismatic lingo -- it is the CENT). By clicking on any of the rare cent dates in the box below, you'll be taken to another section lower on this page for an in depth analysis. These have always been in demand from cent collectors and will always be, yet exist in relatively limited supplies. That's why their values generally trend higher over time. None of the cents listed here will cost a fortune to purchase in lower grades (e.g. Good or Very Good), thus putting them within the reach of the average collector. However, this list of Bullish cents is far from complete... we really need to get some Large Cents from the early US Mint on here (probably not the fabled Strawberry Cent, for it is simply too scarce and generally unavailable). The historically significant and consistently popular 1793 Chain Cent (and affordable, though for a pretty penny -- please pardon the pun) is a good choice and will be spotlighted here as time permits. In the meantime, you can learn more about the Chain Cent and other Large Cents holding great promise by visiting our Rare Coin Values Index. The inaugural small cent, the 1856 Flying Eagle cent had a mintage of only about 2000 (more than half of them were proofs). The addition of an 1856 cent in any acceptable condition is a prudent buy. The coin has seen steady appreciation over the long term, being that an 1856 Flying Eagle cent is "necessary" to complete a small cent collection, but is available only in extremely small quantities. Buy ONLY from reputable sources, as many 1858 Flying Eagles have been altered to appear as 1856. The nation was careening relentlessly toward dissolution and civil war. In 1856, a harbinger of events to come was being played out in "Bleeding Kansas", where both sides of the slavery issue clashed over the admission of the Jayhawkers as a free or slave state. Armed combatants poured into the Kansas Territory, determined to influence the outcome. "Border Ruffians" (right) from Missouri sacked Lawrence in May 1856. A group of fanatical abolitionists, led by John Brown, retaliated by murdering five pro-slavery settlers in Pottawatomie. James Buchanan was elected the 15th President of the United States in 1856, but could do little to ward off the impending disaster. Also in 1856, the 13.5 ton British Parliament "Big Ben" bell was cast. Border Ruffians crossing the Missouri state line into the territory of Kansas. The 1877 is considered the most crucial key date of the Indian Head cent series. The coin has demonstrated moderate to strong gains in just about every condition over time frames short and long, although we've seen price drops in lower grades over the last few years. Color quality (B= BROWN, RB= RED-BROWN, R= RED) has become an important value modifier for Indian Head cents and other copper coins. Going into 1877, the presidential election of 1876 remained unsettled. The Democratic nominee, Samuel Tilden of New York, carried the popular vote by a margin of 250,000. He won 184 electoral votes, compared to 165 for Republican Rutherford B. Hayes of Ohio, but 185 votes were required to reach the White House. Twenty electoral votes, from the states of Oregon, Louisiana, South Carolina, and Florida were disputed. The controversy threatened to plunge the nation into violence. A 15 member commission (8 Republicans, 7 Democrats) was named to decide the fate of the disputed electoral votes. By a straight party vote, all 20 electoral votes were awarded to the Republican. On March 5, 1877, Rutherford B. Hayes (pictured at right) was sworn in as the 19th president of the United States. In one of his first acts, President Hayes withdrew federal troops from the South, bringing to a close the era of Reconstruction following the Civil War. The election of 1876, resulting in a rancorous victory for Rutherford B. Hayes, topped even the 2000 Bush vs. Gore election in acrimony. Owning a 1909-S VDB is a dream come true for every serious Lincoln cent collector. Many collectors get their start in Lincoln cents, and this is likely to remain so. Expect lon term solid demand for the 1909-S VDB from the core of the collector base. Significant price softening in recent years are presenting bargains for buyers. If you can't afford this rarity, then take a look at the 1909-S, for it is very scarce and collectors love it too. Color quality (B= BROWN, RB= RED-BROWN, R= RED) has become an important value modifier for Lincoln cents and other copper coins. Nearly 15 months after it first set sail on a worldwide voyage, an American force of 16 battleships called the "Great White Fleet", named so because all the ships were painted white, returned to the U.S. on February 22, 1909. The mission had two goals: to strengthen ties with the nation's allies, and to demonstrate naval might to potential adversaries. The fleet traveled more than 46,000 miles. William Howard Taft was inaugurated on March 4 as the 27th President of the United States. The U.S. Army purchased its first airplane ever, the Wright Flyer, directly from the Wright Brothers. The cost of the aircraft was $30,000. Lt. Frank Humphreys, trained by the Wrights, became the army's first solo aviator, in October, 1909.
Notable deaths in 1909 included two figures from the Old American West: artist Frederick Remington and Apache Chief Geronimo. 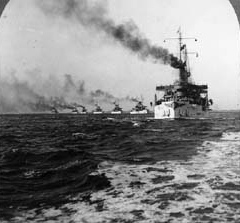 The Great White Fleet circumnavigated the globe in 1907-1909, to show both friends and foes that the United States had become a military power to be reckoned with. Image courtesy Naval Historical Center. The 1914-D Lincoln cent is a classic rarity of the 20th century. Periodically, it explodes in value, but never recedes permanently like some "fad" coins do. This is because collector interest in this dynamo never wanes. As is always the case when buying rare key dates, make sure it has been certified by PCGS or NGC. Lots of alterations out there. President Woodrow Wilson promised U.S. neutrality as war spread throughout Europe in 1914. For years, major European powers had been at odds with one another, but it was the assassination of Austrian Archduke Ferdinand on June 28 that finally provoked hostilities. Mother's Day became an official annual celebration in 1914. President Wilson signed a joint resolution of Congress on May 9 to recognize the holiday. August 15 was the opening date of the Panama Canal. In the ten years it took to construct the canal, an estimated 240 million cubic yards of earth was moved. Cost of the project was nearly $400 million. 5600 laborers died in the making of the canal, due to disease or accidents. American scientist Robert Goddard begins his experiments in rocket science. 18 people were gunned down in Ludlow, Colorado on April 20, as they fled their burning tents. 13 of the victims were children. The violence took place in response to a miner strike against the Colorado Fuel and Iron Company. 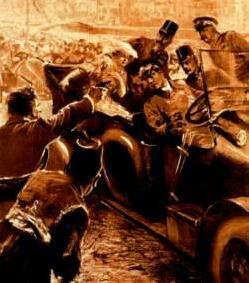 The assassination of Archduke Franz Ferdinand of Austria and his wife on June 28, 1914, was the spark that ignited World War I. Declarations of war sprung forth rapidly, and within a short time, Europe was engulfed in a bloody conflict. All Lincoln cents minted in 1922 came from the Denver Mint, but a few of them are "Plain", that is, they're missing the "D" mintmark. Researchers believe one version of the "No D" variety occurred after a pair of 1922-D dies clashed. The reverse die was ruined, so it was replaced with a brand new die. The obverse die sustained damage to the area around the mintmark, so Mint craftsmen repaired the die to remove the clash marks (and in the process, removed the mintmark), then returned it to service. This newly mated die pair resulted in 1922 cents having no trace of the "D" mintmark and a strong reverse. Other "No D" or "weak D" cents came about as a result of worn, clogged dies, and while scarce, are not nearly as desired by collectors as "no D", strong reverse examples. Insist on obtaining 1922 "No D" cents with the strong reverse. It will cost more than other "No D" examples, but someday, when Lincoln cent collectors engage in a fierce bidding war over your coin, you'll be glad you made the selection. Because many 1922-D cents had their mintmark removed by dishonest operators hoping to con buyers, it is mandatory that you purchase only "No D" cents that have been certified by a reputable grading service. PCGS and NGC are two of the best services. In 1922, the U.S. Senate began investigating charges that Interior Secretary Albert Fall accepted bribes from oilmen Edward L. Doheny and Harry Sinclair, in exchange for drilling rights to Teapot Dome, a federally owned oil-rich tract of land located in Wyoming, and oilfields in California. Eventually, Secretary Fall served time in prison. The Teapot Dome scandal forever tarnished the legacy of the Warren Harding administration. In Italy, Benito Mussolini forms a new Fascist government. King George V opens a new 15,000 seat tennis stadium at Wimbledon. In 1922, the Pittsburgh Observer newspaper writes: "a change for the worse during the past year in feminine dress, dancing, manners and general moral standards". The Reader's Digest issues its first magazine on February 5, 1922. 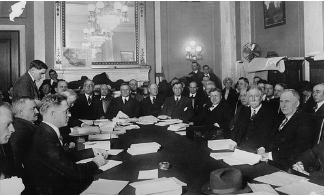 Edward L. Doheny (2nd from right) testifying before the Senate committee investigating the Teapot Dome oil lease scandal. The Teapot Dome scandal dominated headlines throughout much of the 1920's. Had Secretary Albert Fall not spent his bribe money so openly, the truth about Teapot Dome might never have come to light. The 1931-S does not generate as much excitement as other key Lincoln cent dates, but every Lincoln collector needs one to complete the set. Only 866,000 were minted, making it one the rarest coins in the series, but an unusually high proportion of the 1931-S population are preserved in the higher grade range. Obtain the best condition you can afford, with full mint RED for Uncirculated examples. If you pursue only upper crust 1931-S cents from a reputable seller, you'll never have to worry about getting stuck with an overpriced coin. By 1931, the United States was mired in the throes of the Great Depression. The prosperity of the "Golden Twenties" was a distant memory. Bank closings were rampant, as millions lost their jobs. Many Americans lost confidence in President Herbert Hoover, and were looking for a new leader to emerge in the next year's election to lead the nation out of the crisis. Those who could spare a few cents for entertainment flocked to horror movies in 1931. Bela Lugosi in Dracula and Boris Karloff in Frankenstein starred. The world's tallest building, the Empire State Building in NYC, was dedicated. The 1245-ft structure had few tenants. The great inventor Thomas Edison died in 1931. Legendary Notre Dame football coach Knute Rockne was killed in a plane crash while on a recruiting trip. As unemployment soared during the Great Depression, jobless people congregated on empty lots in a number of American cities, where they built crude shelters from salvaged materials, such as packing crates and tin. 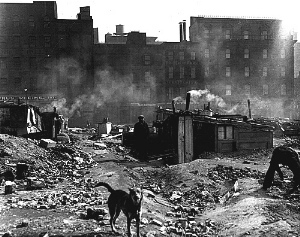 These shanty towns were dubbed as "Hoovervilles", after President Herbert Hoover, who was blamed for much of the misery. Image courtesy National Park Service.